Hapticolor is conditionally accepted to CHI 2016! One of the projects I involved this summer, “HaptiColor: Interpolating Color Information as Haptic Feedback to Assist the Colorblind”, was conditionally accepted in CHI 2016 as a full paper! In this project, we explore the use of haptic feedback on a wristband-like device to assist colourblind people in determining color distance. More details will be revealed in the upcoming months. Posted on December 30, 2015 by chuasoonhau. 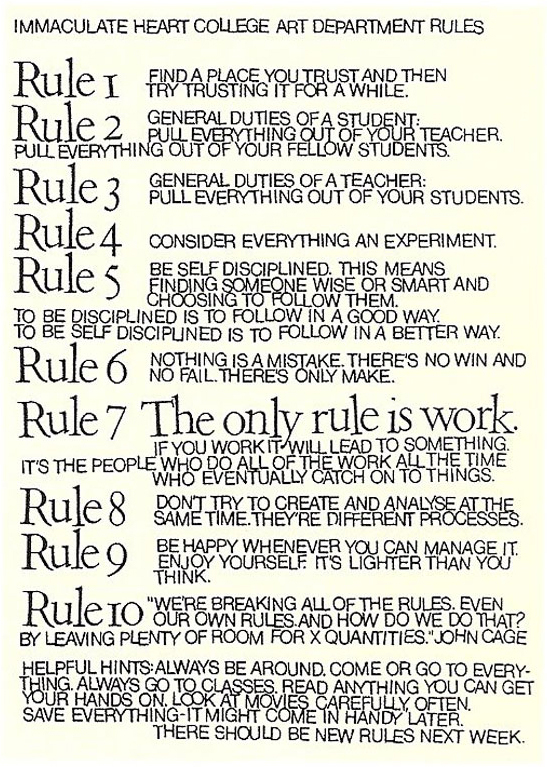 Famous artist and educator, Sister Corita Kent, once set up ten rules for her students in the Immaculate Heart College she once taught during 1967-1968. While they were intended originally for the art students she taught, many people find this list wonderfully applicable to people from all walks of life. Not only they teach you how to work, or the attitude and mentality you should be carrying into the 9 to 5, but also more importantly, on how a human being should be. That we should be not afraid to try; that we should not worry too much on the things we create; that we should be happy and everything is not that big of a deal than you think; that we should break the rules more often; and finally, that we should show up for the things we love. Posted on February 1, 2015 by chuasoonhau. “Understanding Learners’ General Perception Towards Peer Learning in MOOC” was accepted to L@S Conference! The first paper from my PhD thesis project, titled “Understanding Learners’ General Perception Towards Learning with MOOC Classmates: an Exploratory Study”, was conditionally accepted by the ACM Learning @ Scale Conference 2015, a conference focus specifically on online learning at a massive scale, as a work-in-progress. The study in this paper is originated from an initial discussion with the research team on this deceptively simple question: “How should we facilitate peer learning in MOOCs?” We found that although there have been a lot of studies on implementing peer features in MOOCs (think about reputation system, chat room), no study has ever inquire MOOC students about their experiences in learning with other peers in MOOCs. Hence, the motivation of this study is to understand students’ general perception towards this activity in an exploratory manner. We identified a lot of interesting and inchoate insights and we are already en route in expanding this study into a full-scale systematic investigation. I like to thank my collaborators, Juho Kim, Toni-Jan Keith Monserrat, and my advisor Shengdong Zhao for their guidance in this project. For more information on this project, please read the paper and its official ACM page, both which will be released soon. Posted on January 28, 2015 by chuasoonhau. ColorBless was published in TOCHI! One of my research project, titled “ColorBless: Augmenting Visual Information for Colorblind People with Binocular Luster Effect”, was recently published in the January 2015 issue of ACM Transactions on Computer-Human Interaction (TOCHI), one of the best HCI journals in this research field. In this work, we explored the use of binocular luster effect in augmented visualisation, focusing on its application in colourblind aids. Binocular luster effect is one of the many effects made possible with stereoscopic 3D technology (yes, the one you experienced in the cinema nowadays). During the study, we investigated the human factor issues of this effect and used that as a guideline to develop ColorBless. ColorBless is a colourblind technique that applies binocular luster effect onto one of the confusing colours in the image to make it easier and faster for colourblind users to distinguish them apart. Apart from being easier and faster, ColorBless also minimises the underlying colour change of the image, reducing the possibility of colour misinterpretation by users with normal colour vision that are not wearing 3D glasses. ColorBless is particularly useful in a meeting room scenario with both normal and colourblind users, where the colourblind users would wear 3D glasses to see the luster effect. In conclusion, we have demonstrated the HCI application of a novel effect in stereoscopic 3D in augmented visualisation. In the future, we expect the findings would benefit researchers and practitioners who are interested in using the luster effect in other exciting and innovative applications in human-computer interaction. For more information on this project, please visit the webpage of this paper or contact the authors. Posted on January 15, 2015 by chuasoonhau. One overarching issue with using technology, especially in this age where smartphones are ubiquitous and social networks are omnipresent, is our pernicious addiction to our devices in everyday life. The point is that tools are always going to be used for certain things we don’t find personally pleasing. And it’s ultimately the wisdom of people, not the tools themselves, that is going to determine whether or not these things are used in positive, productive ways. While this quote was primarily referring to the potential misuse of technology in developing weaponry, it could also be interpreted as our addiction to computer devices that ultimately leads to our losing sense of touch to the humanities as well as the human-human interaction that exists since the beginning of time. I cannot shake the feeling that his wisdom led to his (and his families) non-technology use in his household. Personally, I believe he is right. Posted on September 21, 2014 by chuasoonhau. Posted on September 6, 2014 by chuasoonhau.